Blake, Kim and Kerry Washington look gorgeous in their stunning outfits, Selena Gomez shows some skin in a white semi-sheer dress, while Jennifer Lopez and Cardi B opt for bold looks. The Met Gala has always been a star-studded event and this year is not an exception. While Rihanna and Katy Perry stunned in their bold choice of outfits, Blake Lively, Amal Clooney and Kim Kardashian turned heads with their glamorous looks. Blake Lively at 2018 Met Gala. “The Shallows” star Blake donned a richly embellished burgundy dress with an embroidered skirt and sheer panels on the waist down to the legs. Amal, who came with her actor husband George Clooney, wore a dramatic Richard Quinn ensemble, featuring a corseted floral bodice and train over black trousers. Amal Clooney at 2018 Met Gala. Kim opted for a vintage look in a chain mail dress by Gianni Versace adorned with cross embellishments. The form-fitting dress hugged her curves perfectly. Her mother Kris Jenner was also present that night, wearing a black dress with gold accents around the neck, chest and waistline, and feather skirt. Kim Kardashian at 2018 Met Gala. New mom Kylie Jenner hit the red carpet with baby daddy Travis Scott (II) and went matching in black. The 20-year-old makeup mogul showed off her post-baby body in a form-fitting dress with a mermaid skirt and a cut-out on the stomach. She added a touch of glamor with tiny glasses covered in gems, which purpose were clearly not to help her see better. Kylie Jenner & Travis Scott, and Kendall Jenner at 2018 Met Gala. Her sister Kendall Jenner, of course, did not miss out the event. The 22-year-old model also kept it simple with an off-white off-shoulder jumpsuit which accentuated her long legs. Meanwhile, Khloe Kardashian, who just gave birth to daughter True, and Kourtney Kardashian, were not seen among the guests. Sarah Paulson and Rosie Huntington-Whiteley at 2018 Met Gala. Other stars who brought glamor to the red carpet included Sarah Paulson and Rosie Huntington-Whiteley, who looked stunning in their embellished gowns. Sarah went with a silver Prada gown which featured a tulle bow in the back, while Rosie opted for a gold number by Ralph Lauren with a halo headpiece. Selena Gomez and Yara Shahidi at 2018 Met Gala. Selena Gomez showed some skin in tiered, subtly embellished gown with semi-sheer skirt. She arrived with Coach Creative Director Stuart Vevers, who designed her dress. Yara Shahidi‘s look was a mix of chic and glamor as she wore an embellished white dress with a tiered skirt. Miley Cyrus and Bella Hadid at 2018 Met Gala. Miley Cyrus opted for a classic look in a simple black dress with very plunging neckline. Also wearing black, Bella Hadid oozed Gothic style in a latex top and gloves with dramatic vest. Her sister Gigi Hadid looked ethereal in a beaded dress that evoked the look of a butterfly wing. Gigi Hadid and Gisele Bundchen at 2018 Met Gala. Gisele Bundchen oozed vintage style in a pale gold gown by Versace. The custom-made “eco” dress was made using 100 percent organic silk and environmentally-friendly dyes. She was joined by her husband Tom Brady who looked handsome in a black jacket with gold accents. Gabrielle Union and Lily Aldridge at 2018 Met Gala. Jennifer Lopez and Emilia Clarke at 2018 Met Gala. Cara Delevingne and Cardi B at 2018 Met Gala. Gabrielle Union and Lily Aldridge opted for fresh looks in their yellow gowns. Meanwhile, Jennifer Lopez, Emilia Clarke, Cara Delevingne and Cardi B made statements in their bold outfits. Darren Criss also showed nontraditional look in a mosaic-style jacket from Dolce & Gabbana paired with red pants and cross-embellished slippers, while “Black Panther” star Chadwick Boseman showed avant-garde look in an ivory cape with gold beaded crosses and a matching embellished suit. Darren Criss and Andrew Garfield at 2018 Met Gala. 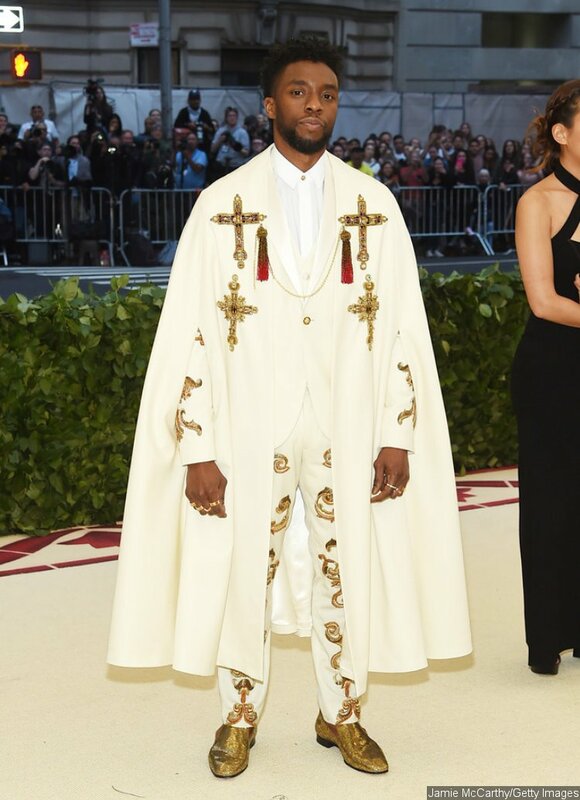 Chadwick Boseman at 2018 Met Gala. Other A-list stars spotted at the bash included Nicki Minaj, Ariana Grande, Olivia Munn, Zendaya Coleman, Madonna, Stella McCartney, Emily Ratajkowski, Paris Jackson, Priyanka Chopra, Alicia Vikander and Andrew Garfield among others.